Here is an article about taking screenshot in Microsoft Windows. Screenshot is very important thing for running your blog/website smoothly. Search engines index your blog with the help of snapshot. Search engines easily understand your article purpose from snapshots. If your blog/site has less snapshots then your blog will not be popular more. Screenshot make your blog beautiful and attracts many visitors. Taking screenshot in Microsoft Windows is very easy and you do not face any problem while doing this. Follow below steps to take a screenshot. 1. 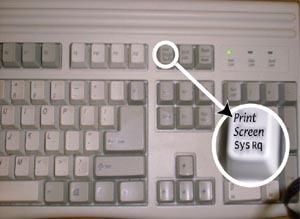 If you want to take an entire screen snapshot then press Print Screen button from your keyboard. 2. After taking snapshot, go to Paint or any other program like Adobe Photoshop and press Ctrl+V to see your Snap. 1. If you want to take a Separate Window Snapshot then hold down Alt and press Print Screen button. 2. Now open your program and press Ctrl+V to see your Snap. If you have any problem about above topic then you can freely ask me in comments. I prefer using softwares like screen print or & windows 7's default snipping tool. It has more options to get the screen shot. Nice post. I didn't about ALT + Print Screen. Fantastic work you have got accomplished, this website is actually cool with great data. Time is God’s method of preserving every thing from happening at once…. That is the great article. Everyone can understand this after read this article. Especially I like their image description.